Adorn your Western décor with the gorgeous, turquoise blue upholstery of this marvelous, handcrafted, Western style bed. The bed has an arched, curved headboard with a matching, arched footboard, and both arches are covered with rich, brown, full grain leather. The lateral sides of the headboard and the footboard are also covered with matching, brown, full grain leather. The top front of the headboard and the footboard are embellished with long, leather fringe. 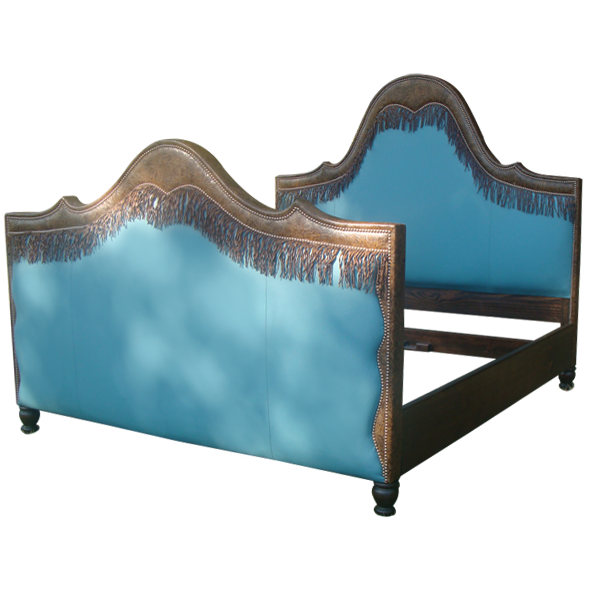 The entire front of the headboard and the footboard are upholstered with turquoise blue, full grain leather, and the upholstery is precision hand tacked to the frame with lovely, gilt nails. The junctions of the leather are double stitched together for extra strength and durability. The bed has a solid wood, structural base, and the bed rest on elegant, hand turned legs. It is made with the best, sustainable, solid wood available. It is 100% customizable.